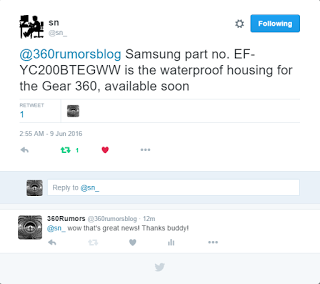 There will be a waterproof housing soon for the Samsung Gear 360. I don’t have any photos yet but it’s described as completely transparent (I suppose similar to the GoPro housing) with an IP68 rating (resistant to 1.5m for 30 minutes). The waterproof housing is Samsung part no. EF-YC200BTEGWW. It is already being offered on some online stores in Europe, at a price of around €60, such as here. With a waterproof housing, the Samsung Gear 360 competes directly with the Nikon Keymission 360, which had been distinguished from its competition by being waterproof but has been delayed to October. The Gear 360 also competes with the Kodak SP360 4k which also has a waterproof housing for its Dual Pro Pack (a pair of SP360’s to provide fully spherical video). Thanks to @sn_ for spotting this and bringing it to my attention!